I'm like a child when it comes to Christmas. I love it. Now is an appropriate time to start putting decorations up and getting all Christmassy. So following on from Mondays post which showed you a mani for a Christmas Party, today I will be going through my makeup look for a Christmas party. As you probably know, I am a huge advocate of primers. 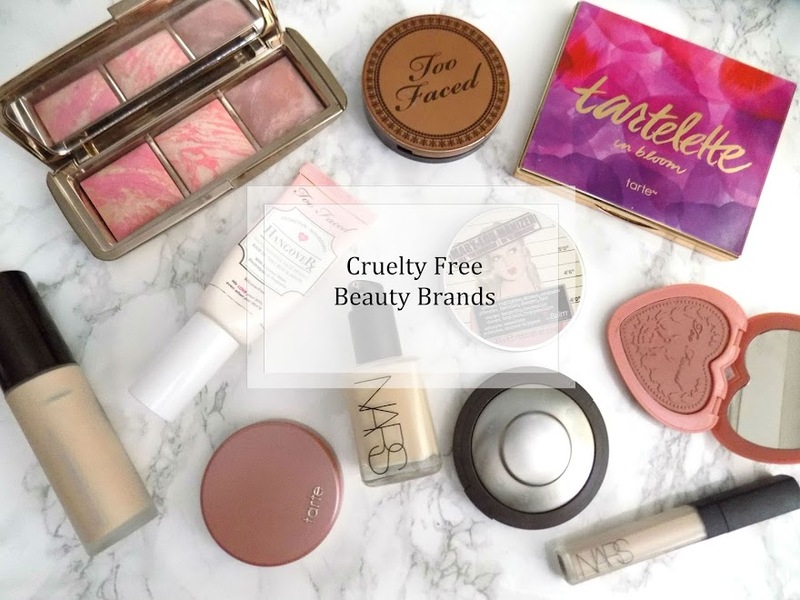 I think they are great for all kinds of reasons but mainly it keeps your makeup lasting longer and with the right formula, your skin has the opportunity to look even more stunning than normal. The Benefit Porefessional is still my favourite and is great for oily skin and large pores as well as blemishes and uneven skin tone. The L'Oreal Lumi Magique is the other one I'm using and it's just great for boosting your skins radiance and providing hydration to your skin. 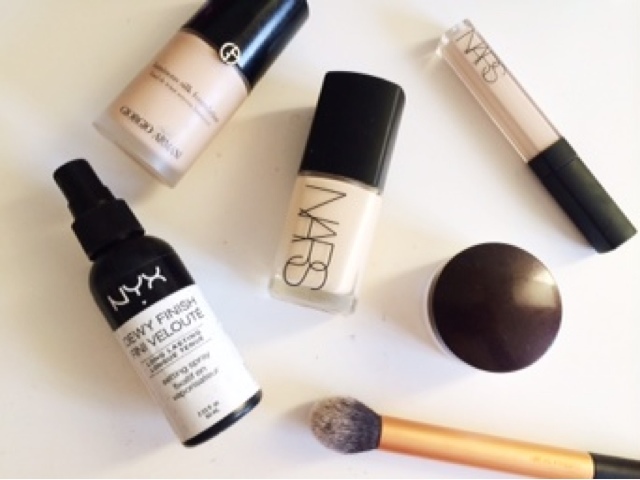 Complexion: When it comes to a flawless complexion, it has to be the NARS Sheer Glow Foundation with a little bit of the Giorgio Armani Luminous Silk. I love how these look together and there's no SPF to cause any flash back. I like applying this with a damp beauty blender as it gives the most flawless look. Concealer is, of course my favourite NARS Radiant Creamy Concealer for dark circles and any blemishes. I set that with the Laura Mercier Secret Brightening Powder with the Real Techniques Contour Brush and then spray the NYX Setting Spray to set everything and keep it lasting all night. 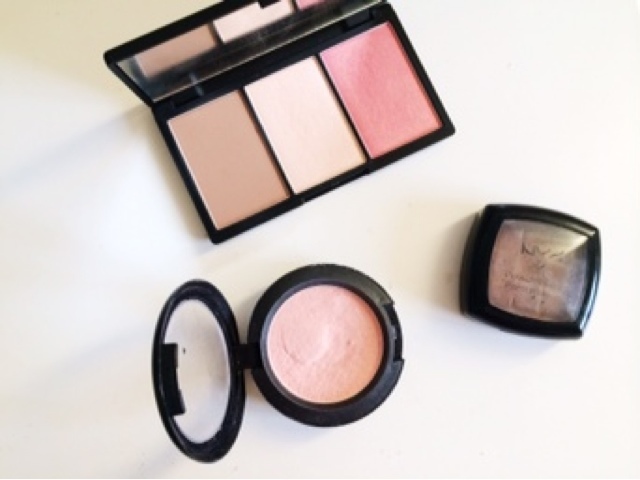 For cheeks it's definitely the Sleek Contouring & Blush Palettes' time to shine. This is incredible and I am completely obsessed with this thing, (you'll see it in lots of other upcoming posts). It's just so convenient. I use the bronzer to warm up my complexion, and then the highlighter to add some extra glow, which just looks stunning. I go in with the NYX Blush in Taupe to contour my cheeks and then go in with the MAC Well Dressed Blusher as I haven't used that in a long time. It gives a nice, light pink flush and a nice sheen. Brows are so important to me now. I think they change a look completely and I'm just obsessed. 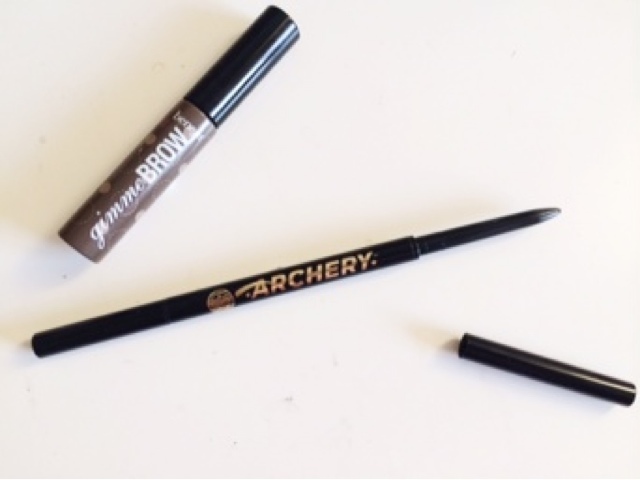 My absolute favourite brow pencil (in case you hadn't guessed by how many times I've mentioned it) is the Soap & Glory Archery Pencil & Brush. The point on this new and upgraded version of the Archery Pencil is so fine and teeny, that it's great for applying little hair like strokes to give a natural yet defined look. Plus, the brush is handy on the other end. To set that in place and keep it from going all over the joint, the Benefit Gimme Brow is just fantastic and I love it. For the eyes I want to keep it simple as I'm going for a bright red lip so I kept it classic and chic with winged liner using the NYC Liquid Liner to get the wing perfect and then I go in with the Maybelline Master Precise Liner to go along the top lashes as I find the NYC one is too liquid-y and it gets everywhere so I just use that for the wing. 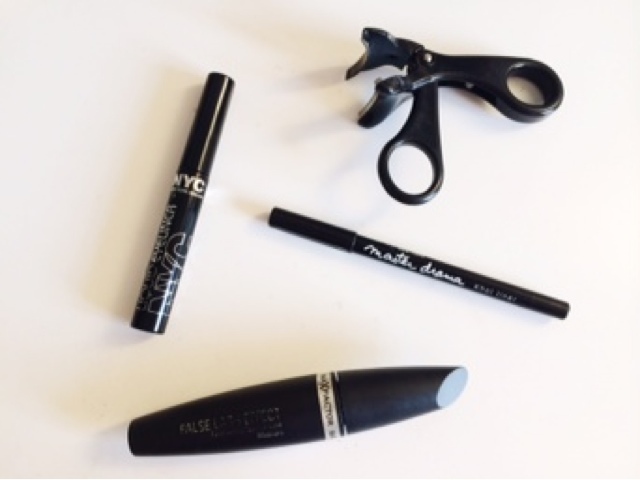 I always apply black eyeliner on the top and bottom waterline so for that I use the Maybelline Master Drama Kohl Eyeliner which I've recently discovered and love. A quick curl of the lashes and a few (hundred) coats of Maxfactor False Lash Effect Mascara and the eyes are done. I've pretty much based this look around the lip as I knew I wanted to use this exact product. You're probably sick of hearing me harp on about these things but this one is a shade I received recently. 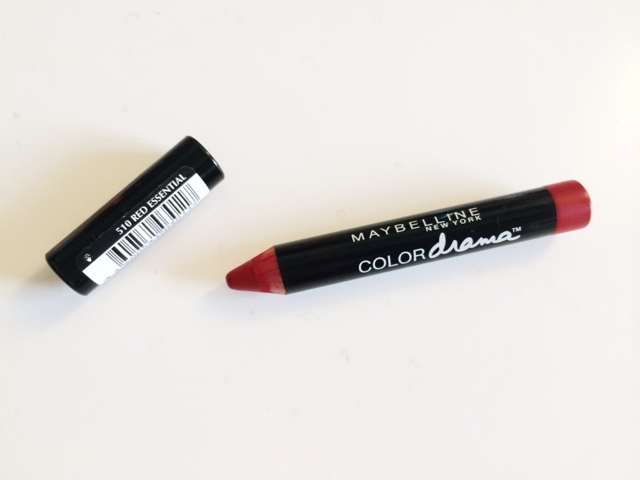 It's the Maybelline Color Drama in Red Essential. This is a bit of a darker red than I would normally go for but I think it's a great shade. It's pigmented, long lasting, matte and I love it. So that's the makeup done. Fridays post is the last for this Christmas party get ready with me style so check back then to see my outfit and accessories. If you're wondering where the makeup look is, check back on Friday to see how the makeup looks on me. 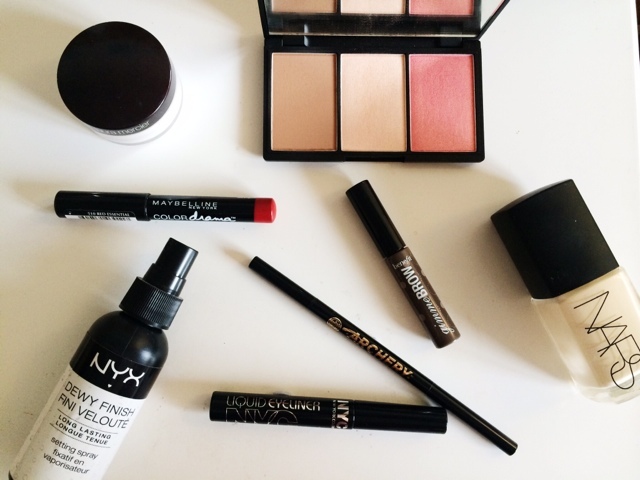 What's your favourite red lip product?